VirtualBox networking is extremely flexible. With this flexibility comes the challenge of making the correct choices. In this blog, the different options are explained and some example use cases are elaborated. Access between guests, host and other members of the network is explained and the required configuration is shown. This information is also available in the following presentation. 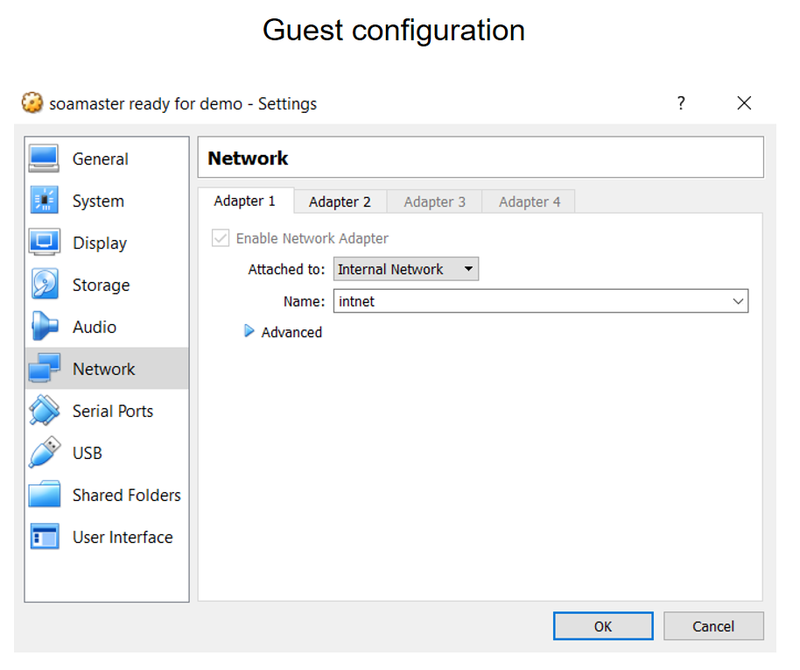 VirtualBox makes available a network interface inside a guest. If multiple guests share the same interface name, they are connected like a switch and can access each other. 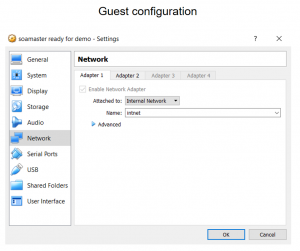 VirtualBox makes available a single virtual isolated NAT router on a network interface inside a guest. Every guest gets his own virtual router and can’t access other guests. 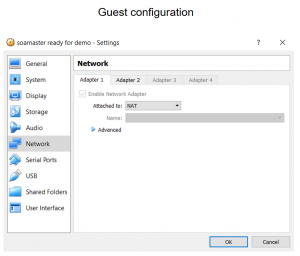 DHCP (Dynamic Host Configuration Protocol) requests on the interface are answered with an IP for the guest and address of the NAT router as gateway. The DHCP server can be configured using a CLI (no GUI support). The NAT router uses the hosts network interface. No specific VirtualBox network interface needs to be created. External parties only see a single host interface. The NAT router opens a port on the hosts interface. The internal address is translated to the hosts IP. The request to the destination IP is done. The response is forwarded back towards the guest (a table of external port to internal IP is kept by the router). Port mappings can be made to allow requests to the host on a specific port to be forwarded to the guest. 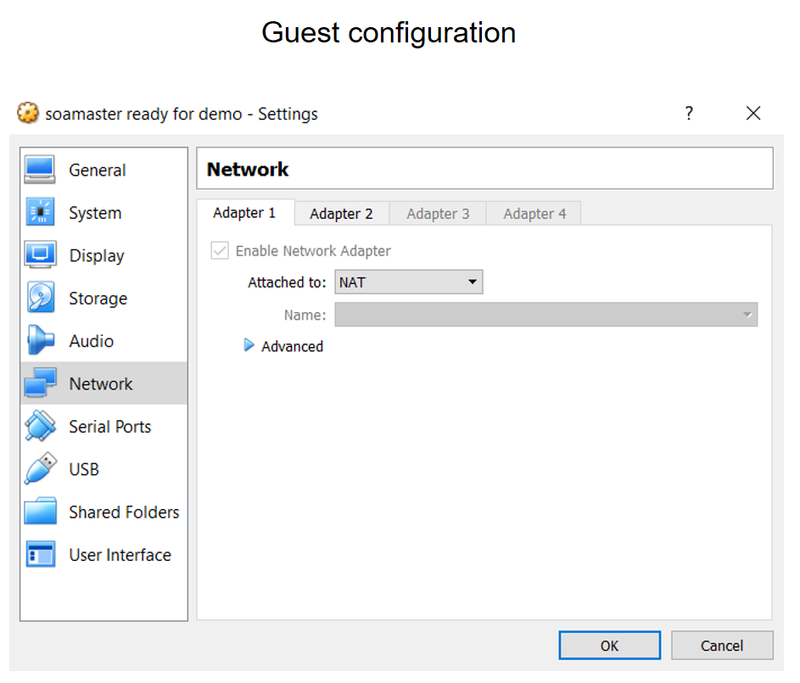 VirtualBox makes available a virtual NAT router on a network interface for all guests using the NAT network. Guests can access each other. The NAT network needs to be created. DHCP (Dynamic Host Configuration Protocol) requests on the interface are answered with an IP for the guest and address of the NAT router as gateway. The DHCP server can be configured. The NAT router uses the hosts network interface. No specific VirtualBox network interface needs to be created. External parties only see a single host interface. The NAT router opens a port on the hosts interface. The internal address is translated to the hosts IP to a specific port per host. The request to the destination IP is done. The response is forwarded back towards the guest (a table of external port to internal IP is kept by the router). Port mappings can be made to allow requests to the host on a specific port to be forwarded to a guest. VirtualBox creates a host interface (a virtual device visible on the host). This interface can be shared amongst guests. Guests can access each other. 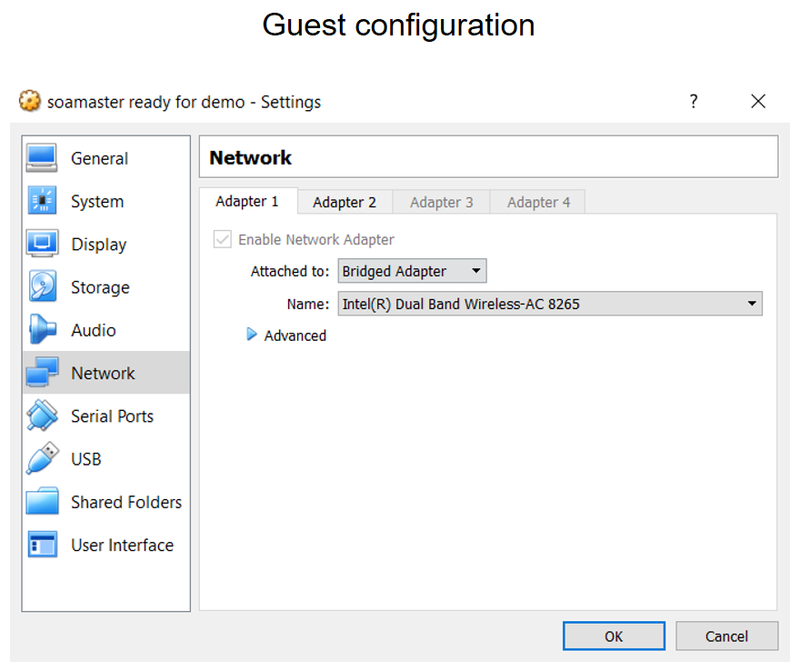 DHCP (Dynamic Host Configuration Protocol) requests on the interface are answered with an IP for the guest and address of the Host only adapter. The DHCP server can be configured using the VirtualBox GUI The virtual host interface is not visible outside of the host. The internet cannot be accessed via this interface from the guest. The host can access the guests by IP. Port mappings are not needed. The guest uses a host interface. On the host interface a net filter driver is applied to allow VirtualBox to send data to the guest. This requires a so-called promiscuous mode to be used by the adapter. 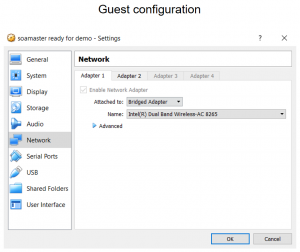 Promiscuous mode means the adapter can have multiple MAC addresses. Most wireless adapters do not support this. In that case VirtualBox replaces the MAC address of packages which are visible to the adapter. An external DHCP server is used. Same way the host gets its IP / gateway. No additional configuration required. It might not work if the DHCP server only allows registered MACs (some company networks) Easy access. The guest is directly available from the network (every host) the host is connected to. Port mappings are not required. The host can access the guests by IP. Guests can access the host by IP. I’ve created an Ubuntu / Spring Tool Suite VM for a course. The VM will be distributed to participants. I want the participants to do as little networking configuration as possible. VirtualBox networking is not the purpose of this course. I’ve created a server inside a VM which hosts an application. The application will be used by (and thus needs to be accessible for) different people on the network. on my LAN, only 1 IP address is allowed on the host. I have a web app running in the ubuntu guest where I configured a static ip address 192.168.56.102 in /etc/network/interfaces. The web server application runs on the port 3000, while four client web applications run on ports 3006, 3007, 3008, 3009 (these are injected into the browser when Browser access them from either Host or from LAN). Web server application on port 3000 also establishes a Websocket (over http) to each Browser session for notifications. I installed nginx on the Host (Windows 10) so that users from LAN can access web apps by entering the hostname of my host. nginx proxy rule then forwards the request to that 192.168.56.102 address in the Guest ubuntu. I configured 3 adapters in VirtualBox: NAT with port forwarding (from 127.0.0.1 to 192.168.56.102, for each of 3006/3007/3008/3009 ports) plus Host-only adaptor plus Bridged adaptor. For each adaptor I allow All access. But everything works only when I access apps from my Host and if Websocket URL in the app is configured for localhost or for 192.168.56.102. When I first access the web app by entering Host hostname:3006, nginx translates that to 192.168.56.102 and the page is rendered. The page itself has a field for Websocket URL and if that field is also Host hostname, then that part of the web app will not work i.e. socket cannot bind. Only when I change manually the URL of the Websocket to localhost, everything works, but in that case users from LAN cannot use the app as they only see Host hostname. What would be best way to configure VirtualBox for this scenario? Thanks for this great post. I’m trying to build a VirtualBox lab with a Domain Controller (+ DNS + DHCP), SCCM Server, and a Win 10 client so that they can talk to each other on a separate network but at the same time can access the internet. Currently I’m using pfSense, but I am wondering if it’s possible without a third party software.